I am so excited to say that all of our Christmas shoppong is done! And most of the gift wrapping, too!!! And I was able to do it without standing in the freezing night air, making small talk with strangers, and watching our breath crystalize while waiting for the doors to open to whatever store. I am so glad someone invented online shopping. By 10 o’clock Friday morning, the sun pooling on my covers, beneath which I was tucked so cozily, I was able to close my computer and smile that smug smile of satisfaction, which only the pretentious early shoppers get to wear. This is my first year wearing it and I must say, it suits me fine! Our goal was to be finished by the end of November, and we accomplished it. Yay! Saturday was a truly magical day. My sweet nephew came home from his mission. I have missed the guts out of him. He is a very special boy... er, man now, I guess. He went to Tijuana Mexico and I missed him so much while he was gone. He has a very calm and quiet manner and reminds me a lot of my grandfather. Which is fitting as he was named after him. Very smart and very quiet but so witty and puny. The best of the best, I tell you. I really hope he can find a girl who deserves him, but I sincerely have my doubts. I got to see him Saturday! They were passing through from Mexico to Idaho, and stopped for a few hours. He is just the same as ever, but now has that amazing missionary glow. It was wonderdul talking with him again. Before I left to my parents house to see them, Jeffrey warned me to not be too upset as I would probably not get to talk with him at all, everyone else would be eager to dominate his time as well. I got lucky, I guess. I got so much Matt time, and it made me happy. I love that kid so much! Sunday we were finally well enough to go to church as a whole family. It was the first time since before Kip was born, and we were even nearly on time! Yesterday was a rough day. See, when Kip was 2 weeks old he was circumcised. Except due to wrong instructions from the doctor, and me following them to a T, it healed up wrong. 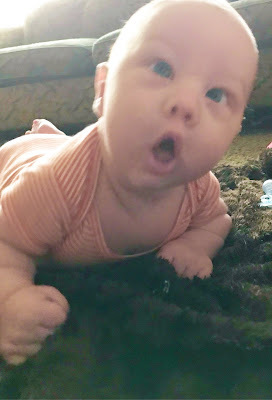 When he had his two month appointment last week, the doctor and I had a discussion, figured out where the miscommunication happened, and then realized that we would have to re-do it. It now became a necessity rather than an optional procedure. So that was scheduled for yesterday. We got to the doctors office at 7:30 am and left at 9. I couldn't believe it took so long. 'sure the doctor wasn’t happy with how long it took, either, as I’m sure he had other patients. But I am so grateful for fitting Kip in. Yesterday, understandably so, he wanted to be held all day. He slept real well after he got some Tylenol, happily. While he was sleeping I was able to run to the DI and I found a toy chest, and a dresser. I couldn’t believe my luck! I’ve been looking online for a few months foe a toy chest that we could afford. Same for a dresser. So I got them and we went home. Kip went to sleep, and I started cleaning like a mad woman. Beth’s room has been sorely neglected for months! Faye moved out and into her own room in August, and left it a nightmare! Except I never had a chance to help Beth clean it. With the help of a toy chest and a dresser, though, things are coming up roses. I was able to get her room mostly clean last night, and finished today. 3 trash bags later, and taking apart and reassembling the toddler bed, Vince is officially moved in to Beth’s room, and next week I can get started on Kip’s room. He’ll be moving in there in just a few months! While that was exciting about today, the real highlight was picking the kids up from school early and going to the temple. One of my very best friends got married last year, and I just love his wife to pieces! We have become very good friends. And so when Shaun and Lisa invited us to their sealing in the temple, well really, how could I say no? It was beautiful, and I cried. I am SO happy for them! While I was in the sealing, my parents watched my kids, and then took us over to the ice cream parlor and treated us. It was so sweet of them. I think that is basically it. I am filled with so much gratitude and joy for the past few days. So many wonderful things have happened! Can't miss the wonderful styling and interior at this place. As I walked upstairs, my eyes wandered about the brick wall interior and the overall décor. This is by far one of the best event space Chicago to organize event.